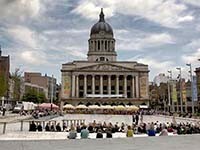 Nottingham - The famous city of the UK. The town was named after a legend arose of Robin Hood. In this city, with a population of 273 000 people currently open one IKEA store.